Subject description: and how to use it ? 37 pages ! i use a lot Pfind, which is the tool. Other tools are available, especially this one : you are somwhere in a directory, you right click your mouse, et choose find. YOU get that search tool. What's its name. I dont understand how to use it . Tell me the name of that search tool.... and how to use it ? Posted: Mon 20 May 2013, 07:13 Post subject: to find a text in a pdf file ????? !!!! Subject description: I you have it, tell me ! to find a text in a pdf file ????? !!!! I you have it, tell me ! Does it exist ? it's for my job. Merci. Pelo- see if this script fits the bill..
Posted: Mon 20 May 2013, 07:47 Post subject: search in pdf : puppy linux does it ! Subject description: OK, i will try, however not very clear for me. I explain my job ; i have my ... 500 machines controlled once a year. My controlling society mails me the reports under pdf format for each one. But the number of the machine does not appear anywhere else that inside the report. I have to open each report to know what machine is concerned. Puppy linux woud find inside pdf the machine number ? Ouah ! I presume your file manager is rox (usually standard in Puppy). If this is correct, you are talking about rox's built-in search feature. The button to the right of the "expression" field will give you some help on it. There may be more help in the rox manual. Thanks for pfind and pfilesearch. 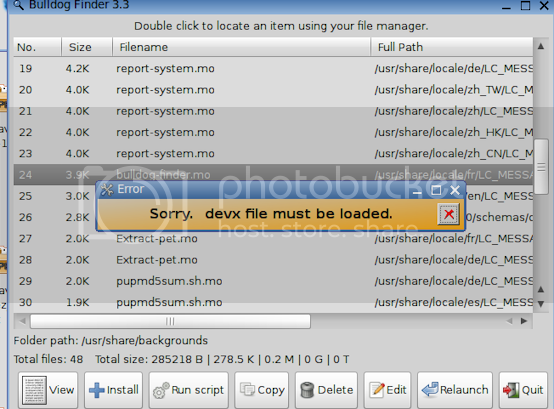 Although I usually use pfilesearch, I noticed this about pfind 5.11 in Wheezy 3.5.2.7 and thought I should let you know. Pfind works smoothly, but when "advanced" is selected, the gui does not accommodate it well. the 'Advanced' feature is easier to use. Posted: Thu 17 Oct 2013, 15:03 Post subject: Problem with pfind and openbox? Have there been any reported problems of using pfind when openbox is the wiindow manager? The problem occurs if you search for some files and then when they are displayed you right click on one of them but instead of clicking on one of the right-click menu items you click on the screen behind the menu - pfind crashes. Any assistance on how to diagnose what is going wrong would be appreciated - running pfind from the terminal does not produce any error messages when the crash occurs. to Zigbert so he knows about the problem. The application doesn't crash. It's still possible to quit the app normally. I wrote Bulldog finder to avoid using pfind in openbox. DIVERSION is deleted from Puppy. - Use only gtkdialog as executable - not gtkdialog3/4. - Use icon from libstardust in .desktop file. - Incease size of default window. - Bugfix: Export searhresult to text editor deactivates pFind for more searching. Posted: Mon 14 Apr 2014, 11:41 Post subject: How to integrate Fredo, my search assistant, into P find? I would like to go on working with Fredo again in Puppys find! Is there any possibility to make this dream come true? What are your exact dream? I have no experience with XP.